What’s more is that wet flower bouquets, also called fresh flower bouquets, are so easy to make they afford just about anyone a chance to bequeath their special touch to a bride’s wedding day. Even more, bridesmaids benefit from appealing fresh flower bouquets as well. Although flower arrangers can choose between real flowers and artificial flowers for designing flower bouquets, using soft moist real flowers gives flower bouquets more authentic appeal. This boquet of carnations, roses, baby’s breath and other flowers was created to keep the blossoms moist and fresh the day before the wedding. Wet flower bouquets stay fresh for days and last even longer when kept cool in the refrigerator until ready to use. Fresh flower bouquets also adorn tables and beautify rooms when decorating for any special occasion. The first thing to do when making a wet flower bouquet is decide what type and color flowers to use. Roses, lilies, and carnations are very popular bouquet flowers, however, these are only a few among many. The next most important item besides flowers is the bouquet holder. For this project, a wet flower bouquet holder, made with a water absorbent foam base, is the one required. Remaining materials are listed in the middle of this page. Note that some materials are optional. Immerse bouquet holder in water so foamy material base becomes saturated. The saturated base provides water for cut flowers. Saturate the foam by filling a bowl, pot, or other large container with water. Container should be at least twice the size as foam base. Some wet flower bouquet holders come with foam that provides nutrients to sustain flowers. For flower holders that are not pretreated, use a bit of powder that comes with fresh flowers by sprinkling a bit of powder in water that foam is placed for soaking. Leave foam immersed in water for at least forty-five minutes to assure complete saturation. While the foam base is filling with water, set the stemmed flowers in water also. Watering flowers now lets them quench their thirst and perk up flower petals while awaiting foam placement. If you purchased flowers with a flower sustaining solution, add the powder to the water. Once the foam base is filled with water, stabilize the handle for flower insertion to prevent the holder from falling over when flowers are inserted into the foam. Support the bouquet handle by flipping it right side up and placing it in a strong vase. Use an extra piece of foam or other stuffing material to secure handle and prevent it from moving about in the vase. If no large vase is available, set bouquet holder in any type of container that is long enough to engulf the handle and narrow enough to support the base. If container does not appear strong enough to support weight of flowers, drop marbles, pebbles, coins, or similar objects in the container bottom. Remove flowers, one at a time, from water source and use sharp scissors or paring tool to reduce flower stem lengths. Cut stems at angles so they can absorb more water and slide easily into foam base. Stem lengths should be roughly two to three inches beneath flower heads. After each stem is cut, push cut ends into wet foam base. Hold each stem firmly while performing this procedure and avoid disturbing flower petals. Continue pushing each stem into foam until each stem stops. If stems stop before they look and feel secure in foam, remove them and place them again. Leaves can be placed between flowers as well as at the base of the foam. Cut leaf stems at heights that complement flower lengths. Place flowers in the foam beginning with large flowers and work small flowers around them to fill vacant areas. Set large flowers in base at random or place them in a pattern or design. For instance, set all large flowers in an arch toward center of the base and then set smaller flowers on either side of the arch. Alternatively, arch large flowers in a curved plus sign from center of the base and then set small flowers around the plus sign. Another alternative is set large flowers in groups of three or four flowers and then set small flowers between groups. When using ribbon, cut two or three eighteen inch pieces for bouquet. Observe bouquet to assess best places for ribbon placement and then use a blunt tool to push ribbon into foam. Leave a four inch tail at ribbon end. Repeat the procedure on opposite end of bouquet. Once the first ribbon is intact, cut a second ribbon and embed it crosswise above first ribbon using the same ribbon embedding procedure. If bouquet handle has a hole at the tip you can insert ribbon in the hole. Inserting ribbon in the hole is simple. All necessary is to cut ribbon to desired length, insert it through the hole, and tie it gently so that it does not thread back out of hole. Allow ribbon tails to vary in length to give finished bouquets more style and grace. Place finished flower bouquet, preferably in the vase, in a cool place until it is time to use it. If traveling with bouquet, place it, along with vase, in a box that is wide enough to accommodate the entire bouquet length plus width. Stuff newspapers or similar material around vase to keep it in place. A great place to purchase flowers is at a warehouse such as Costco and Sam’s Club. Purchase flowers as close to the day you need them as possible. The same day should be fine if you have a couple hours of free time to assemble the bouquet. 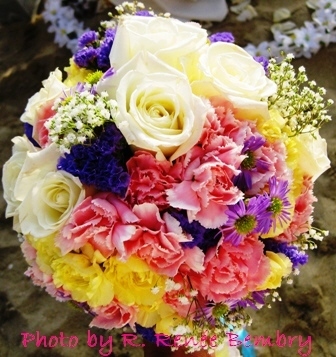 Match flowers and ribbons to wedding theme colors or at least make sure colors complement bridal gown. Use polyester ribbon for over-the-flower placement because polyester will not absorb water from the wet foam. Flowers like roses have thorns you will need to avoid so as not to prick your fingers or other body parts. Be careful not to injure your fingers when cutting stems with scissors or paring knife. Glass vases could tumble over and break if they are not heavy enough to hold flowers as they are added to bouquet foam. Cutting stems for foam placement must be done in a manner that makes stem tips poky.